Looking for the best deal on SculpSure in Los Angeles? Take advantage of our limited time offer, while supplies last: $799* for one treatment with 4 applicators, $1199* for two treatments. We offer the best pricing on Sculpsure in Los Angeles. If you are looking for affordable SculpSure™, give us a call to book your appointment while supplies last! *May not be combined with any other promotional offer. Limited time only. Regular price: $1,500 for one treatment with 4 applicators, $2500 for two treatment regions. Controlled energy delivery of highly selective wavelengths, targeting fat cells below dermis, leading to non surgical lipolysis, with elimination of fat cells debris over time. An additional benefit of SculpSure™ or non surgical fat removal treatment is the increased production of collagen and elastin, creating a firmer, younger appearance / body contouring in the treatment areas. This is an effective cellulite laser treatment protocol. Procedure time is 25 minutes. There is minimal to no pain or discomfort (some report slight stinging, burning, cramping discomfort). Patients can return to work and other activities immediately after SculpSure™ / Liposculpture session. At Burbank Aesthetic Medical Spa, we help you achieve optimal health as you age. Our holistic health practitioner will tailor an anti-aging program that best helps you improve your physical, mental and spiritual health. Our non-invasive anti-aging therapies–including SculpSure™ / Liposculpture, Botox®, Juvederm, laser procedures, iv nutritional therapy (Myers Cocktail)–help you strike the perfect balance of radiance and beauty on the outside, leading to happiness and good health on the inside. Burbank Aesthetics Medical Spa is staffed by a holistic primary care physician and functional medicine doctor, Dr. Cynthia Thaik and two registered nurse, Alice Abramian (licensed aesthetician) and Doddie Wilson (adult nurse practitioner). Combined, these practitioners have over 30 years of experience in the beauty and aesthetic field, having performed countless injections, skin rejuvenation procedures, and advanced laser therapy. 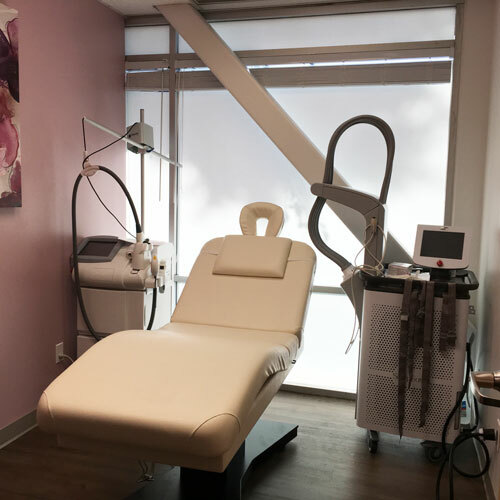 The center provides SculpSure™ / Liposculpture, body contouring, cellulite treatment, and other laser services to residences of Burbank and greater Los Angeles area. For more information, visit Burbank Aesthetics Medical Spa. If you’ve been struggling to lose those last few stubborn pockets of fat, but maintaining a healthy diet and exercise don’t seem to be working, then SculpSure™ may be the right option for you. This non-invasive laser body contouring therapy breaks down fat cells permanently, so it is ideal for those looking to slim down and get rid of love handles, saddlebags and fat pouches in the abdomen and back areas. SculpSure™ is an FDA-approved fat removal procedure that has been cleared to treat the abdomen, flanks, inner and outer thighs and back. Because it is a non-surgical treatment, it does not require injections, incisions or even anesthesia. The procedure is quick, efficient, painless and requires no down time afterwards. Each individual is different, so the amount of treatments will vary depending on your particular problem areas and goals. Many patients require only one treatment to see a significant reduction in fat, while others may require multiple sessions to treat the same location if there is substantial fat to lose or to gain the best body contouring results. At Burbank Aesthetics Medical Spa we consult with each patient individually to develop a customized SculpSure™ cellulite and body contouring treatment plan to meet your desired goals. What can I expect during the SculpSure™ fat removal treatment? During your 25-minute SculpSure™ treatment, the practitioner will apply contouring trays to your problem areas. The applicators have cooling devices, so once they are turned on, you will feel a cooling sensation. Many patients describe a slight tingling feeling but no pain. Some patients have reported a slight stinging or cramping sensation. In this case, the practitioner can adjust the energy level for comfort. How long until I can get back to my normal activities? The best part about SculpSure™ is there is no down time, so you can get back to your life as soon as you step out of the office. This means you could have the treatment during your lunch hour and return to work or daily activities straight away. Are there any side effects from a SculpSure™ treatment? The majority of patients experience no side effects from their SculpSure™ treatment. However, some patients have reported feeling a slight burning, stinging or cramping sensation during the treatment and light to moderate skin discoloration and/or discomfort after the treatment. These symptoms typically go away anywhere from a few hours to a few days after the treatment. SculpSure™ quickly and efficiently targets fat cells and destroys them permanently, so you can expect to see a significant reduction in fat and cellulite in the areas treated. The procedure also encourages the production of elastin and collagen, which works to strengthen the skin. The results are a slimmer, more shapely body with skin that looks and feels more toned. Although the SculpSure™ procedure breaks down fat cells immediately, it takes some time for your lymphatic system to eliminate those cells from the body. Many patients see results as early as six weeks after a treatment with continued improvements over the following weeks. It usually takes about 12 weeks for your body to completely eliminate the fat cells and for you to see optimal results. Once the fat cells are destroyed and eliminated from the body, they no longer exist and do not regenerate, so the results could last indefinitely. However, a second procedure may be needed after the initial 12 weeks to continue to stimulate collagen production and eliminate any excess fat that was missed with the first procedure. Generally though, most patients find the results are permanent, especially when combined with a healthy diet and exercise. How does SculpSure™ compare to surgical liposuction? SculpSure™ has several advantages over surgical liposuction. The biggest difference is that SculpSure™ is non-invasive fat removal procedure, while surgical liposuction involves anesthesia and incisions. Secondly, the recovery time for SculpSure™ is immediate, while surgical liposuction requires one or more weeks of recovery time. Most importantly, SculpSure™ treatments are far more comfortable and less painful than surgical liposculpture. How does SculpSure™ compare to CoolSculpting™? SculpSure™ has several advantages over the CoolSculpting™ procedure. One advantage is the treatment time is half the duration of the CoolSculpting™ procedure. With the SculpSure™ procedure, several areas can be treated during a single session, while CoolSculpting™ only tackles one area at a time. 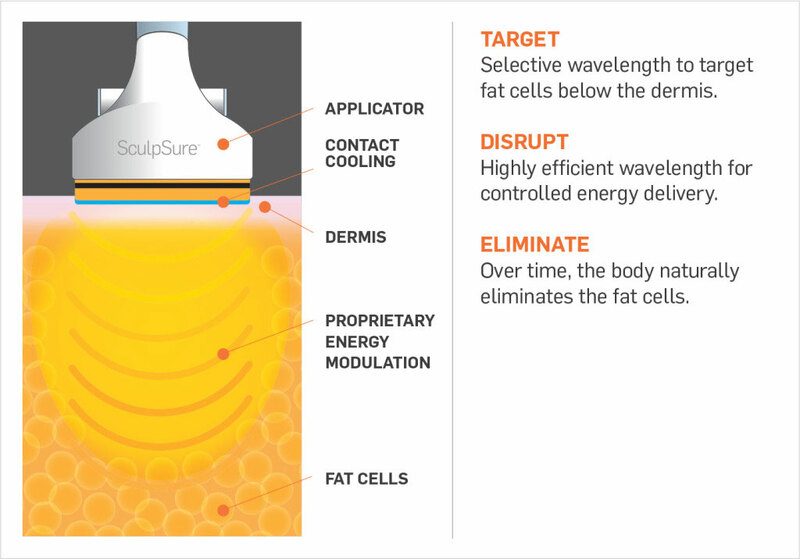 SculpSure™ also stimulates both elastin and collagen, while CoolSculpting™ does not. Moreover, SculpSure™ treatments are far more comfortable and less painful than CoolSculpting™. The pricing for SculpSure body contouring treatments in Los Angeles is based on the number of applicators. The average abdomen takes 4 applicators (one area), which can be run in one single 25 minute cycle. Most patients see the best results when they have a series of two to three treatments. All initial consultations for SculpSure™ are free of charge. We guarantee the lowest competitive pricing for SculpSure™ body contouring treatment in Los Angeles and Burbank. We offer huge savings on bundled services (multiple SculpSure™ treatments, cellulite laser treatments or wrinkle reduction, Ideal Protein weight loss program, IV Nutritional therapy, Myers Cocktail). We offer both normal and after business hours appointments for the convenience of our patients. Limited time offer, while supplies last: $799* for one treatment with 4 applicators, $1199* for two treatments. We offer the best pricing on Sculpsure in Los Angeles. If you are looking for a deal on SculpSure™, give us a call to book your appointment while supplies last!